Hello Everyone! I thought I would share one last post before we leave in a couple of hours on our trip. I just had to share these beautiful photos I took after a humdinger of a storm Monday evening. These were taken from our back deck, overlooking the hills to the east of us. 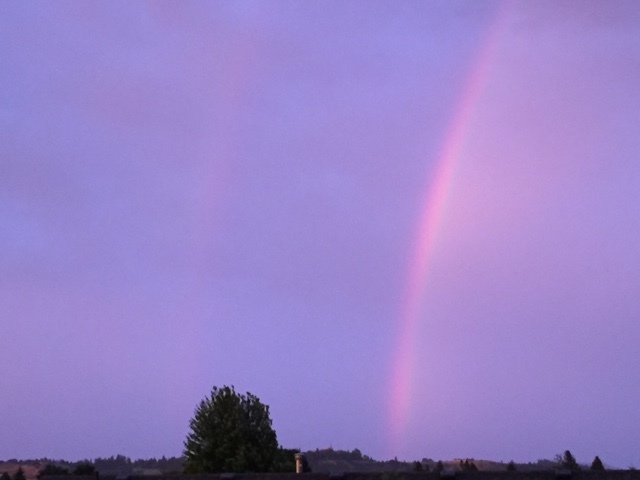 Can you see the faint outline of a double rainbow? This was the other side of the arch. It was gorgeous and I was sorry I didn't see it until it had begun to fade somewhat. The storm apparently did cause some damage at the lake. Our trailer is fine, but Lori called me and said a tree fell on one of the cabins and several mobile homes in the park. Lots of branches down too. We had a lot of people without power here in Spokane, but we didn't lose ours at all. 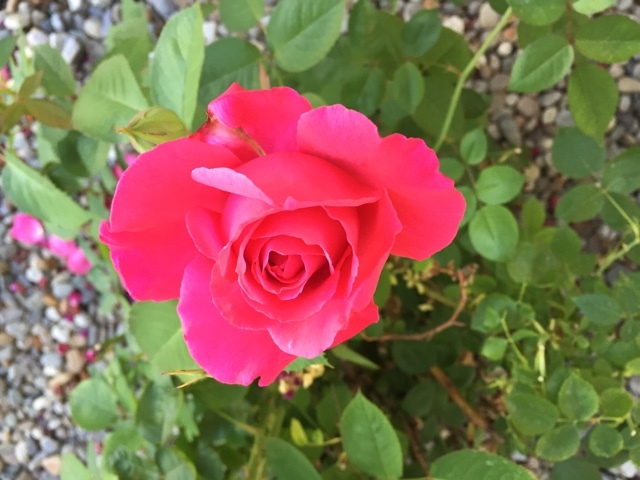 And a stunning rose in my backyard last night. 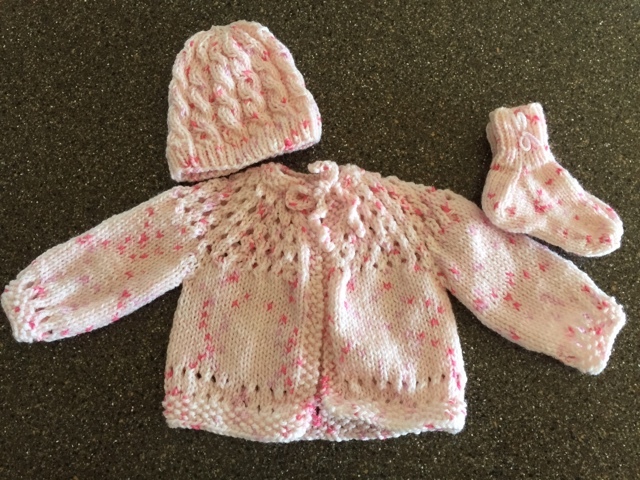 I finished a baby set this morning and will make more while riding in the truck. These will go to the hospital and Crisis Nursery. The truck is all packed, Dennis did that last night as he doesn't want me lifting anything. Goodness it's full! The whole back end has "stuff" for Mandy and Brad. I added my toothbrush etc., this morning. I just have to add my purse and knitting bag. I got up at 5:30 this morning and took Dennis to work and will pick him up around 3:00 or so. He works very close to the freeway so it will save us almost an hour in driving time by me taking him this morning. When I pick him up we can just jump on the freeway and we'll be on our way! I woke up this morning to an almost pain-free back for the first time in months! I hope that continues and I'm sure all of your prayers are helping tremendously. Praise the Lord! I'll see you all soon and I'll try to check in on your blogs when I'm not playing with Miss Piper...but no promises. Grandma life comes before blogging!!!!! Safe travels!!!! And that baby set is the cutest thing ever! That's a pretty set you made, you are a prolific knitter! I hope you and your family have a wonderful trip. Thrilled to hear you were nearly pain free this AM. Praying for safe travel and that the trip is full of joy! Lovely images sis, thank you indeedy!!! I am so excited for you. Praying that you will remain pain free. Have a wonderful time and create some amazing memories. Praise God your back is feeling better. That is awesome. Safe travels sweet friend...and enjoy your trip. ((hugs)) Blessings always. Beautiful rainbows... Glad you had no damage to your home at the lake. Oh the rainbows are lovely. Such a promise they remind us of! I'm so happy you are feeling good as you start this lovely trip. Prayers for your safety and fun! and the donation of the baby set is just wonderful! ! Safe travels and God-speed! The rainbow (yes, I can see the double!) and the baby set are beautiful! Love you, too, sweet friend! 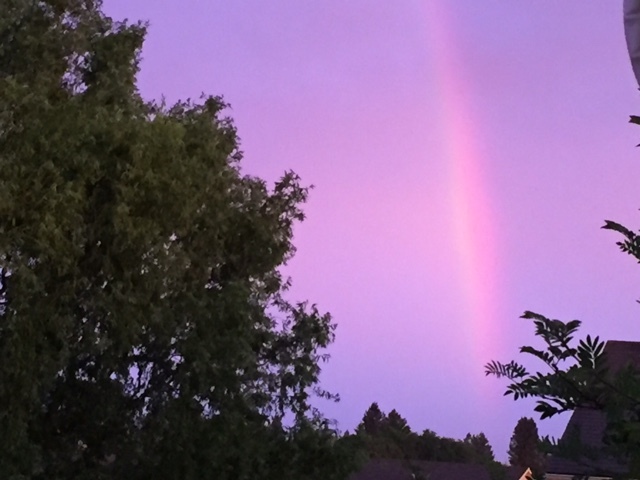 OH, the rainbow was amazing...what a precious reminder of God's love and promise to us all! He is so faithful. I do trust your back is still doing really well, and you have no pain on your trip! Hope you are having a wonderful time!!! Hope you are having a fabulous trip! Enjoy, and Happy Fourth!